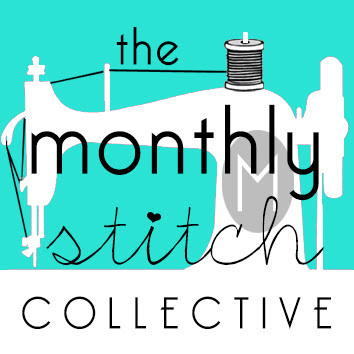 I'm participating in Pattern Review's Sewing Bee this year, despite my reservations about contests. 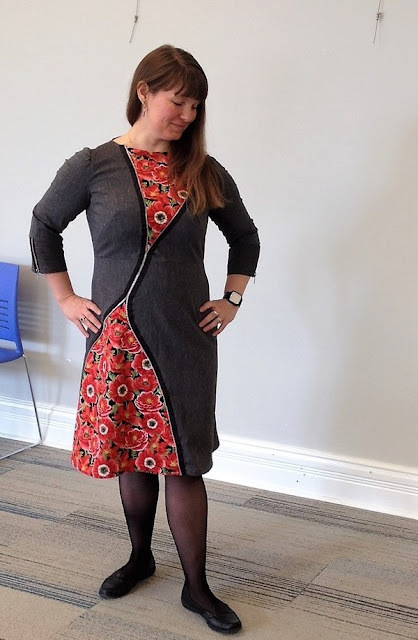 I happily passed the first round with my Korali Cardigan, and now have just learned that I've also passed through the second round with this Zipper Illusion Dress. 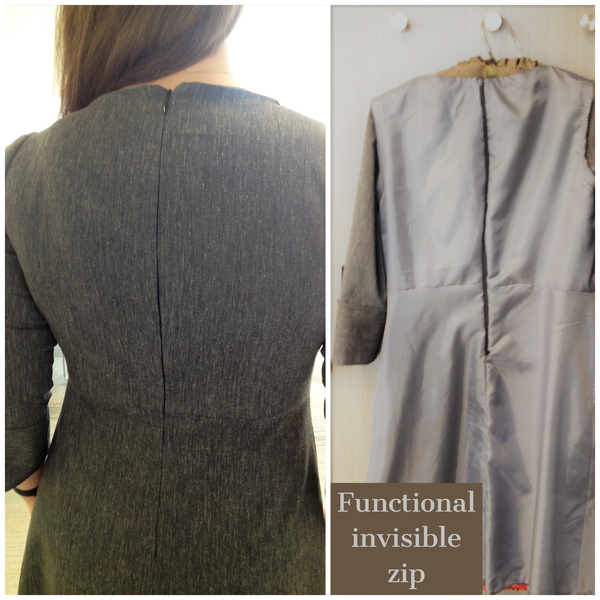 The challenge in this round was to create something which used zippers as a central feature. It had to contain at least one functioning zipper and show some creative use of the zip as a feature. After looking through the zippers I already owned and checking out local thrift stores and my Fabricland I came to the conclusion that I just had to use what I had as best I could. So this is what I came up with: I was inspired by the idea of how zips can both conceal and reveal, and by some online images of zipper tattoos which look like they're unzipping skin -- though that is kind of gory and not what I was going for at all! I melded that idea with the contrast between a muted workaday self and the more colourful creative self we might keep under wraps most of the time. 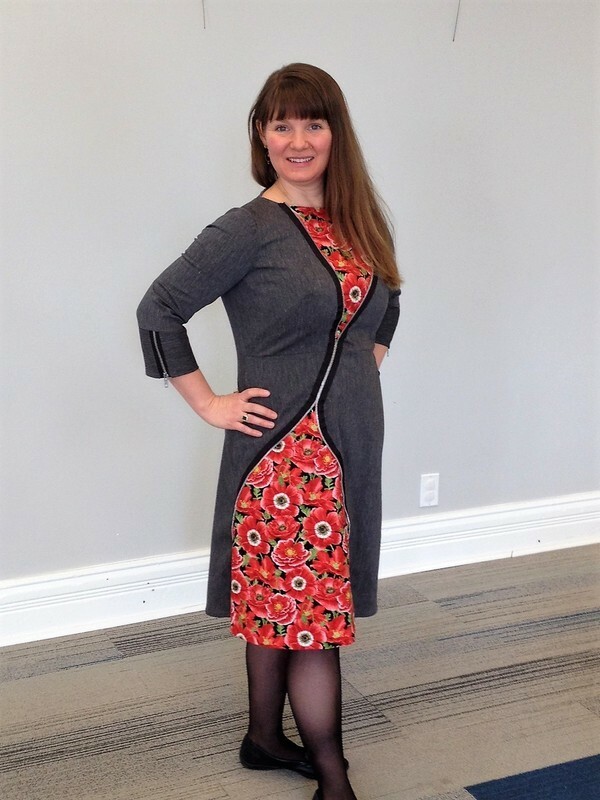 I used a very straightforward Simplicity pattern, 8123, as my base dress -- I've used it before and the clean lines are useful in a project. I put the dress together and added a full lining. I then appliqued a long zipper tape to the front by placing the dress on my dress form and laying it out by hand to get the shape I wanted. I stitched the zipper down over large pieces of a poppy print cotton, stitching right up along the teeth. When that was secure, I trimmed the excess cotton and stitched the outer edges of the tape down as well (pressing the tape with a bit of steam first helped me to get the outer edges to conform to the curve a little more readily). 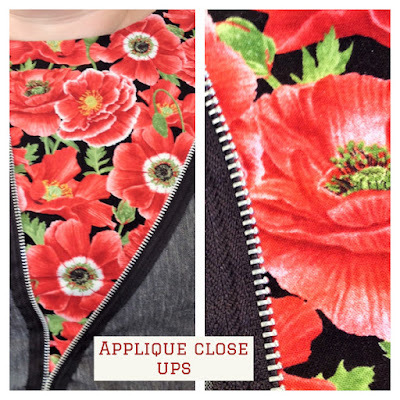 Once the applique was done, I adapted the sleeve flounce in the pattern to incorporate a sleeve godet, using matching chunky zippers to close it up or open to reveal more poppy print. 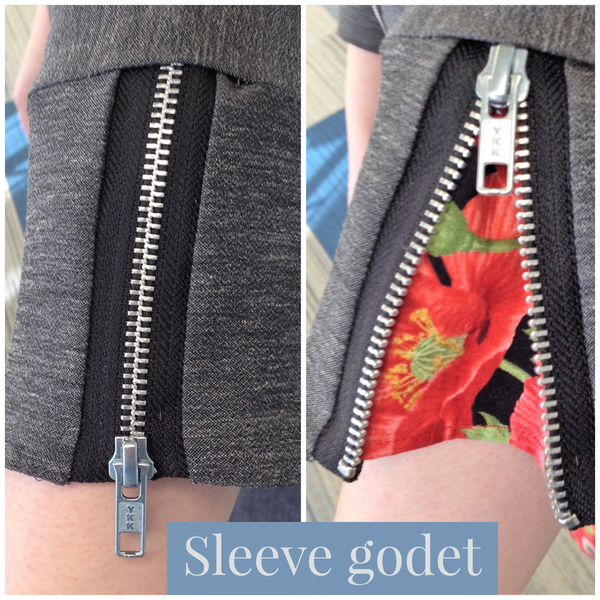 I left some of the zipper tape exposed to tie them into the front design more closely. Once it was all done I got my friend and coworker to model it for me to get some nice clear photos, and it looks fantastic on her. I'm so glad she is nearly exactly my size :) This project was a real challenge, taking quite a lot of thinking and planning and lots of handstitching to get it done. But since it's moved me on to Round 3 I guess it was worth it all! I really like the results. That is just amazing. Your truly creative mind coming out!! Who would have thought off doing all that? Well done. 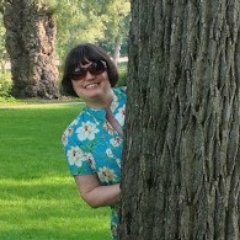 Well done and all the best for round 3 of the sewing bee. Thank you! I hope I can make something worthy of round 3! That is wonderful, so creative!! !